We are a leading Wholesale Trader of electric rubber mat, insulating electric mat, electrical rubber mat, insulation electrical mat, insulating electrical rubber mat and insulation electrical rubber mat from Ahmedabad, India. We also engage in providing our clients a highly durable range of Electric Rubber Met. These mats are known for their impeccable design, smooth finish and optimum insulating property. Our highly experienced professionals, we are instrumental in offering premium grade Insulating Electric Mat. Widely installed at power transmission rooms, sub stations, and work stations the offered mat can be ordered from us at a leading price. 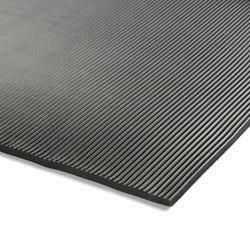 We are pioneering the domain by providing high in demand Electrical Rubber Mat. 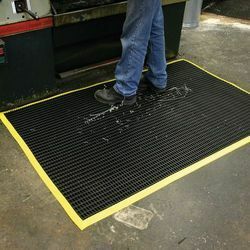 The offered mat is water and moisture proof and specially designed to prevent service technicians and maintenance personnel from electric shock at work. Widely installed near HT & LT control panels and in front of switchboards, the offered mat is compliant to ISI standards of quality and safety. Leveraging on wide expertise, we are instrumental in offering best quality Insulation Electrical Mat. We bring forth the cost effective item for surface preparation that is used in a range of applications including galvanizing, electroplating, welding, enameling, glass coating and rubberizing. Our offered mat are trusted by a huge clientele from aerospace, ship building, forging and steel plants. 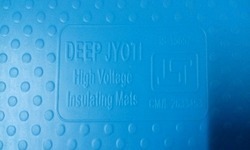 We are one of the chief trader of Insulating Electrical Rubber Mat. 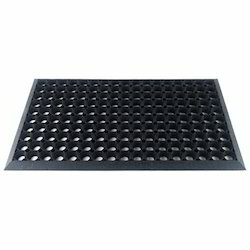 We can supply the Electrical Insulating Mats in any length and width as per customer requirements. Used as floor covering by safety concious organisations for the protection of workers on high and low voltage installations upto 66KV ac and 240V dc where human safety is a prime concern.